THE ECCENTROPEDIA: A Buffet Of The Strange And Fascinating In All Its Flavors – Schlockmania! A proposition like The Eccentropedia seems like it would lend itself to sensationalism or perhaps a snide attitude towards the subject matter. After all, the book’s commercial hook is that it is exactly what its title suggests: an alphabetical listing of biographies for history’s most famous eccentrics, with explanations of what made them so unusual. Thus, it is a pleasant surprise that The Eccentropedia doesn’t use its subjects as punchlines to an endlessly repeated joke but instead encourages the reader to appreciate and perhaps understand the many ways that eccentrics have had an impact on our lives. This thoughtful approach is just one of the surprises in The Eccentropedia. Another is in the people who populate its pages. There are a handful of people you would expect, usually celebrities whose eccentricities are part of their mystique (Liberace, Michael Jackson, Mae West, etc.) and historical figures that would be recognized by devotees of the eccentric (Salvador Dali, Ed Wood Jr., Howard Hughes, etc.). However, those familiar names are seriously outnumbered by a lot of people whose names would otherwise be lost to time. Great examples include the Cherry Sisters, who became renowned for having perhaps the worst variety act in entertainment history, and Sapurmurat Niyazdov, a dictator of a small Eastern nation who became infamous for his bans, like forbidding his citizens to use car radios or play video games. Another surprise with The Eccentropedia is how disciplined and thorough the writing is. Part of this comes from all the time and study that author Chris Mikul has invested in his subject: he spent many years publishing a zine entitled Bizarrism that was dedicated to the subject of eccentrics. You can see the fruits of those labors in his introduction to The Eccentropedia, which not only defines the concept of eccentricity but also gives a concise, smartly written history of the subject in just six pages. This intro also sets a tone for the entries that fill the book: Mikul pens his case histories in a spare but artful style, laying out the specific details that make up a person’s eccentric history without ever lapsing into cheap jokes or voyeuristic exploitation of the story at hand. He’s capable of seeing the humor in the lives of his subjects yet treats them with dignity. He is also careful to mention if someone’s eccentric labors resulted in something that the world benefitted from in a social or cultural sense. Indeed, the pages of this book are littered with famous names: musicians like Erik Satie and Glenn Gould, the famous architect Antoni Gaudi and author Yukio Mishima, to name just a few. Along these lines, there are also examples who people who a smaller and more localized but no less interesting impact on their surroundings. Perhaps the most interesting example of this is the story of “Eternity Man” Arthur Stace, whose religiously-inspired habit of writing the word “eternity” as a bit of graffiti became an influential part of the fabric of life in Sydney, Australia. The end result is worth the read whether you pick and choose entries at random or read it from cover to cover. Though it is time-intensive, Your Humble Reviewer recommends the latter choice because it really allows the reader to delve into the heart of the book’s subject matter. Reading case after case allows you to see the recurring patterns of eccentricity that crop up time and again in history: rich people whose fortunes fund their odd obsessions, people who create magnificently detailed artwork in secret, people who spend their lives as fanatical misers, those with religious visions, people who persevere in the arts despite a lack of talent and universal derision, etc. Watching these patterns develop and exploring the many forms they take is one of the biggest joys of reading this book. 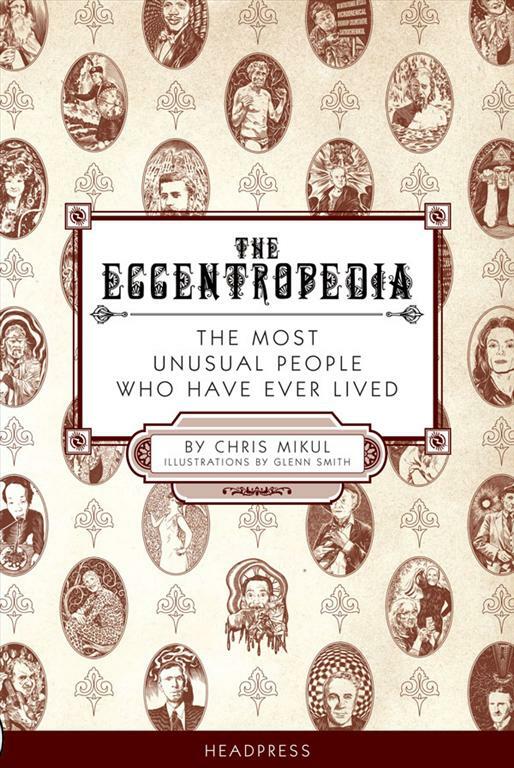 In short, The Eccentropedia is a must for the bookshelf of anyone with a serious interest in the unusual. Spend a little time thumbing through its pages and you’ll soon discover there are more flavors of eccentricity than you could possibly imagine.